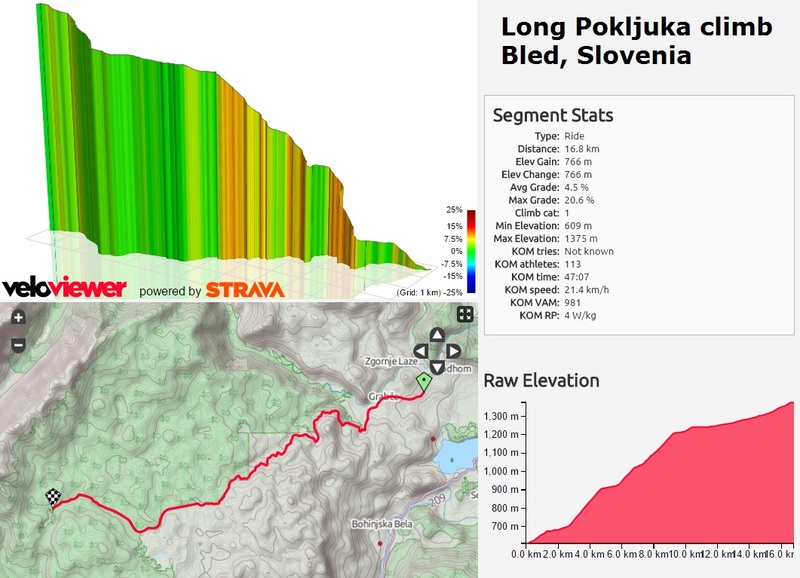 This is a Catagory 1 road climb in Slovenia starting from just outside Lake Bled and rising up through Triglav National Park to the Triglav Pokljuka Sports Centre and also a ski resort near the top. As it winds it’s way up the mountain, the road rises for over ten miles and 2500 feet at an average gradient of five percent. There are a couple of signposted 12% and 18% sections and a max gradient of 20 percent. Triglav Pokljuka Sports Centre has a cafe at the top, but there’s not much of a view. Lake Bled is a fantastic base for road cycling, mountain biking, hiking or just lazing around the incredibly fairytale-like lake. There are also plenty of other adventure sports such as white water rafting and paragliding available to book from the town. On the day I cycled traffic was minimal and the road surface smooth apart from some damage repair closer to the summit. My attempt was on a mountain bike I hired in Bled so I really, really must get back to Slovenia one day with my road bike. There’s plenty of other challenging climbs through the Julian Alps I still need to ride! Biggest climb I’ve ever ridden – such a shame I didn’t have my road bike! Slovenia looks beautiful. Never been – one for the bucket list. It’s fantastic. One of the top countries I’ve been to in Europe. The capital (Ljubljana) is good for a short break, but the countryside and coastline are both well worth extra time to explore!